Ryan Voight, the "East Coast hang-gliding celebrity" from Ellenville, N.Y., will be at the Lookout Mountain Flight Park to conduct a landing clinic for interested pilots and discuss his time in the sport as a pilot, author and photographer. While he may not be a household name for everyone, in the world of hang gliding Ryan Voight is a rock star. On Saturday, the "East Coast hang-gliding celebrity" from Ellenville, N.Y., will be at the Lookout Mountain Flight Park to conduct a landing clinic for interested pilots and discuss his time in the sport as a pilot, author and photographer. "It's a pretty big deal for sure," Lookout Mountain Flight Park instructor Aaron Johnson said recently. "He's pretty famous in the sport, and everybody knows who he is." Voight has been soaring through the air since shortly after he learned to walk. He learned the sport from his father, Paul, who teaches out of the Fly High Hang Gliding school in Ellenville. "(Ryan) took his first hang gliding lesson when he was like 4, then soloed when he was 12," Johnson said. "His dad was one of the original hang glider pilots, and he trained from a young age." Ryan Voight was recently named instructor of the year by the United States Hang Gliding/Paragliding Association, which is the sport's governing body. "Launches and landing, just like in any form of aviation, is definitely one of the most important things," Johnson said. "Safe landings are at the forefront -- safe and stylish, of course." There are currently about 14 pilots signed up for Saturday's clinic, and there are limited spots still available for the $99 event. For information on signing up for the clinic, call 706-398-3541 or visit www.hanglide.com online. The day will start with Voight discussing the proper techniques of landing and showing videos to teach better and safer form when approaching the landing zone. After that, the clinic is scheduled to move outside for students to put their skills to the test and learn where they may need improvement. "The cool part of the whole clinic is we're going to do tows ... or foot-launches if the wind is in the right direction at the mountain," Johnsons said. "(Voight is) going to ... getting video of everybody's landing, and we'll do a diagnostic of everyone's landing. Breaking down all the parts of it and how you can improve each person's landing. What you did right, what you did wrong -- everything that goes into doing the proper beautiful-looking flare." The landing clinic starts at 8:30 a.m., and several other pilots and spectators are expected to be on hand to watch. 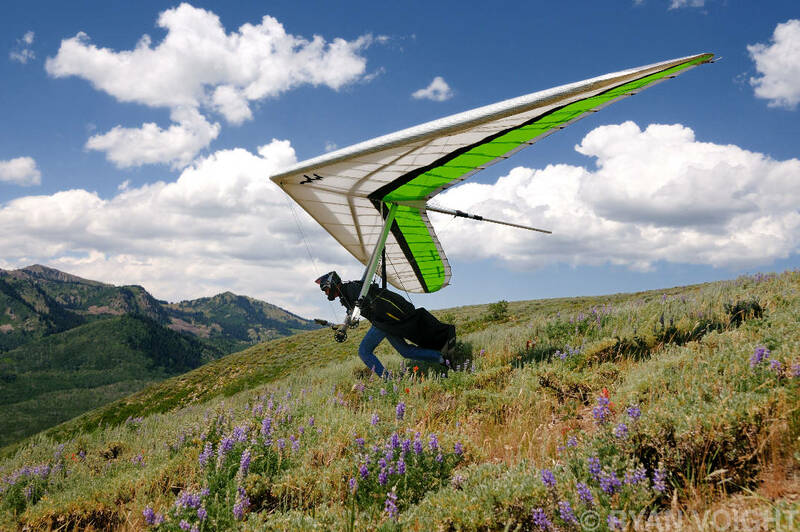 Ellenville and Lookout Mountain are considered two of the top hang gliding destinations in the Eastern United States, and Voight's visit will also be a chance for pilots from those two areas to get together for a day of learning and fun. "We're calling it 'the Ellenville invasion' because we're the Lookout gang," Johnson said. "Not that there's any competition, but they're our other brothers in the sky." Voight said he will be bringing about 12 folks down from the flight club in Ellenville to take advantage of the warmer weather in Tennessee and the outstanding facilities at Lookout Mountain Flight Park. "They are a big part of growing the sport and making it what it's become," he said of the facility in Dade County. "We are a small community in hang gliding, but they are a big fish in our little pond. "They've made it like a country club experience down there." Contact Jim Tanner at sports@timesfreepress.com. Follow him at twitter.com/JFTanner.